The BNP Paribas Open has grown to become the fifth largest pro tournament in the world and a phenomenal spring tennis destination. What most fans undoubtedly don't know is the story of how this all happened, or more specifically how founder Charlie Pasarell made it happen, in association with friends and partners. Charlie was a top American player in the 1960's, developed by our own Welby Van Horn - but more on that later. 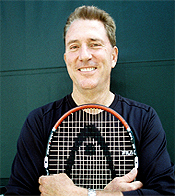 In 1966, Charlie won the NCAA singles title while at UCLA. A year later he reached the #1 men's ranking in the United States. I had the chance to sit down with him and asked him to sketch out his vision and how it was realized in the history of the event. Did you know that the tournament actually began 30 years at the LaQunita Resort? Or that Charlie had to build a hotel in order to build the second stadium at the second location, the Grand Champions? Or how the current complex was born, a facility which many people in tennis, myself included, think is the best on the planet? Watch this revealing interview. This guy is extremely well mannered and softspoken, and also obviously highly intelligent. But you'll also feel how people who stepped on the court against him have described him to me - a fierce competitor who sets out to win.